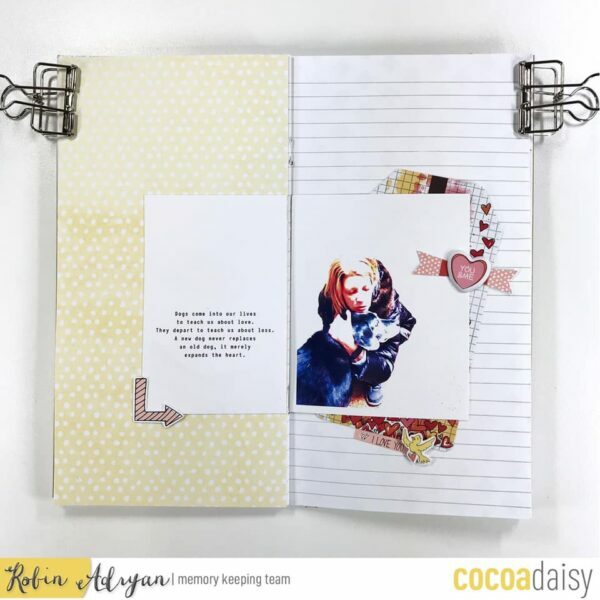 Today I’ve got some memory keeping inspiration for you from Robin and myself incorporating the planner kits! I find I am not the fanciest of planners but the kits always come with SO many cute things that I often will incorporate them in with my memory keeping kits and use them on my pocket pages or traveler’s notebook layouts. Both Robin and I used a mix of the the Simon and Betty Kits with very different results. I love the colours Robin has going on in her pockets! The black and white with bold reds and soft pinks is perfect for right now and looks great. Those cut out hearts from the planner paper are perfect in that top pocket! 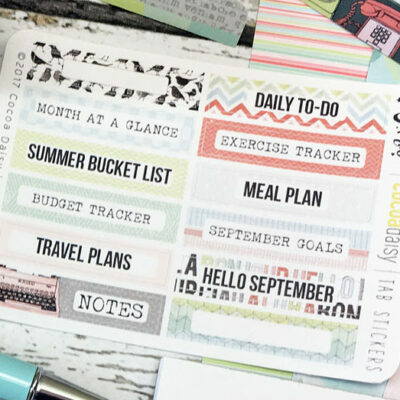 The planner tabs are also great to add to journal cards from the Memory Keeping Pocket kit. 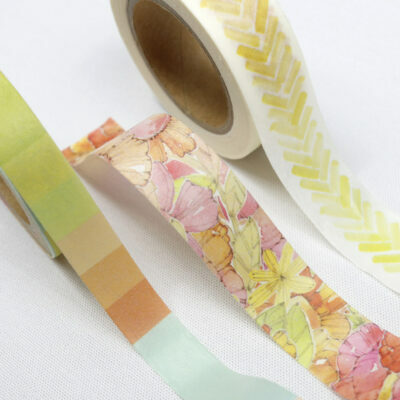 They add a polished look that really finishes off a page nicely. 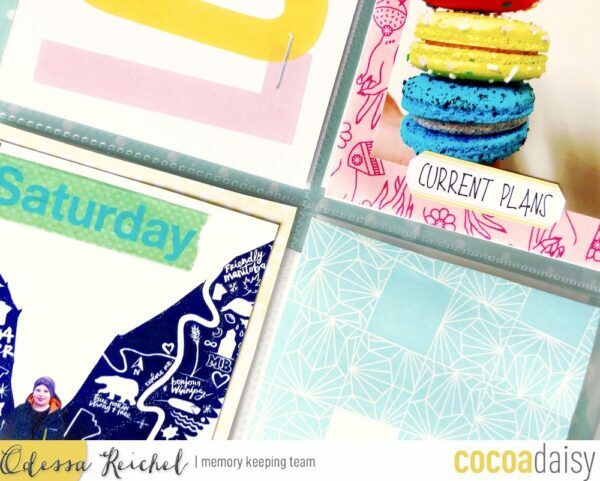 The big acrylic piece from the Memory Keeping kit is perfect on top of that planner paper! 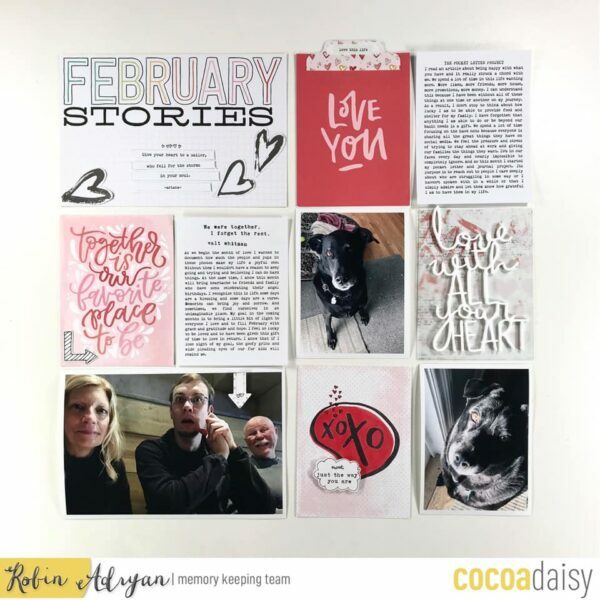 Robin did a great job of using the speech bubble from the Planner Kit die cut ephemera and some stamping to transform the journal card into her own creation. I just started my scrapbook for the year and decided to go back to 6×8 for a bit. 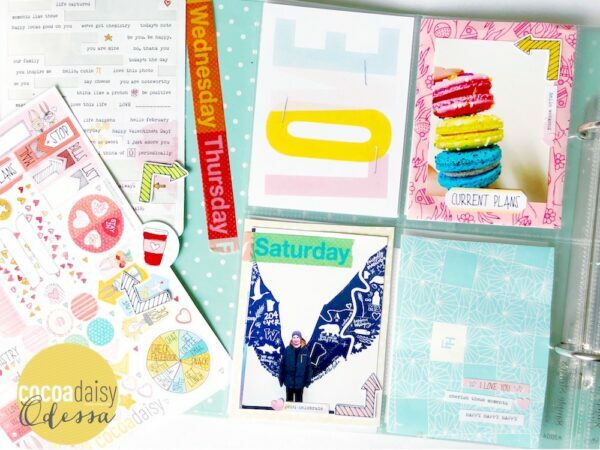 This page uses some elements I really like, washi, bold journal cards, packaging (the bases for both of the pockets on the right are from food packaging) word stickers and cute shapes. I used some of the smaller stickers and die cut ephemera from the planner kit which worked nicely on this smaller scale page without overwhelming everything else going on. The planner stickers actually work pretty great in pocket pages! The current plans sticker was just what that pocket needed to finish it off. 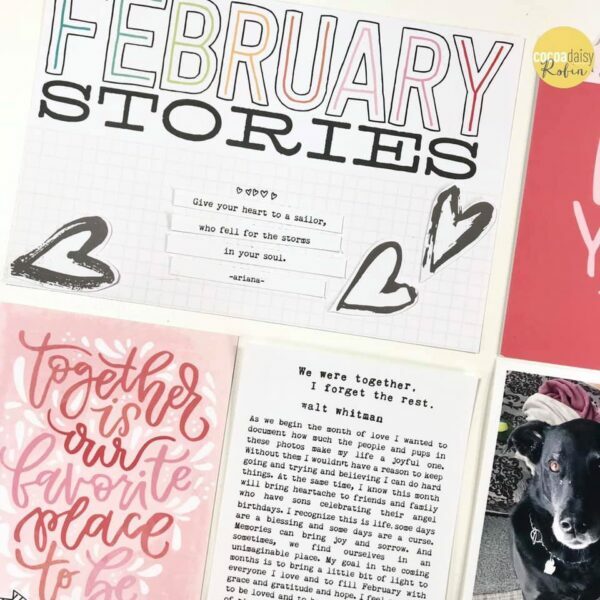 I used the yellow polka dot paper from the planner kit under the bottom left photo to balance the colours on the page with the journal card a little better. The colours this month were so playful! 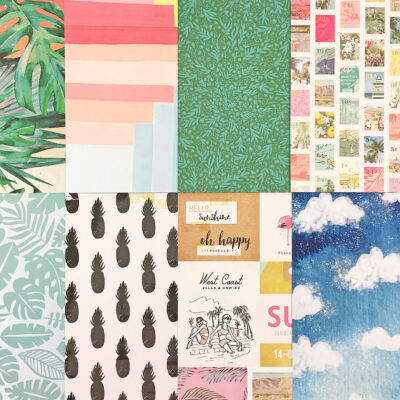 The blues, greens and yellows go great with the traditional February reds and pinks without looking too rainbow-y. 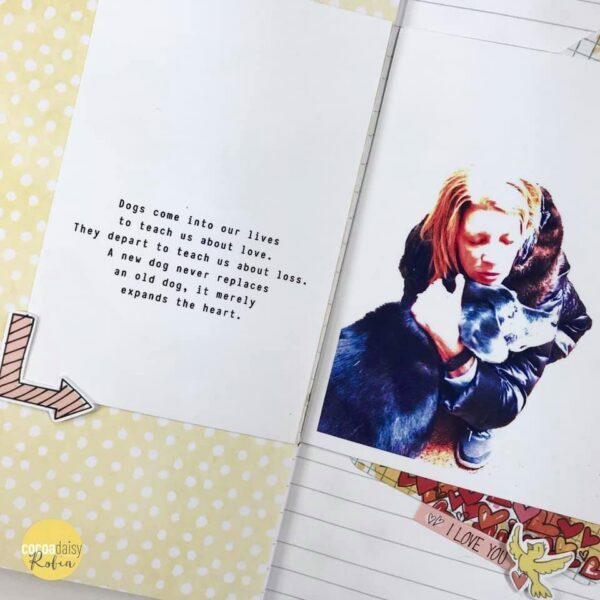 Robin used some paper and ephemera from the Planner kit in her traveler’s notebook to make this touching tribute to her dog. 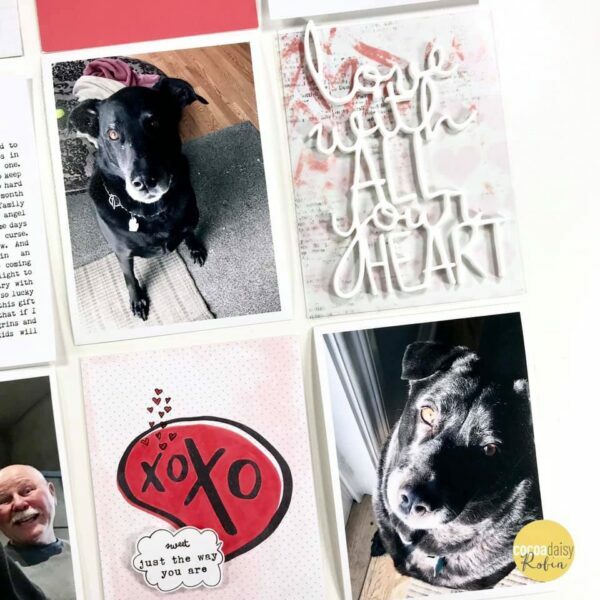 The paper she chose as the background on the left goes great with the tag under the photo and embellishments from the Planner Kit. 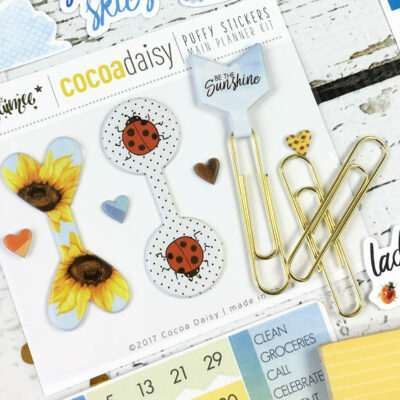 It also works really well because the more minimalist text is on a patterned background while the colour photo is on a more plain background for a really pleasing sense of balance on her page with a great cluster of embellishments to draw your eye to all the right spots! 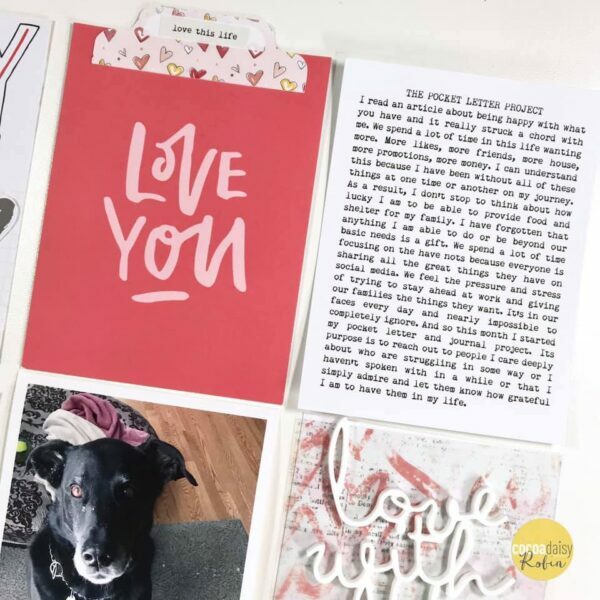 I hope this post inspired you to use your planner kits in your memory keeping!